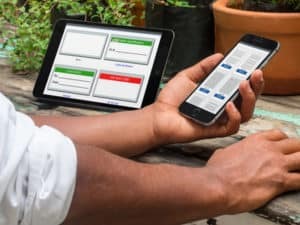 There has been a bunch of talk on line about handheld printers and now a new app to link them all together. Well that’s nothing new we have been downloading test results from structured cabling project for the last 15 years or more in excel and importing into the label printing software at a fraction of the cost of hand held label machines. 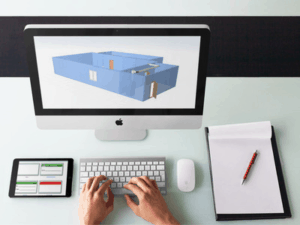 Network Connections Group USA has new 3D CAD web based design and estimation software which will auto label you design and is fully exportable into our web based software. This data can be sent to and from site in many formats or the tech’s can even use the 3D Cad software on their mobile device to get to the data for the labeling. So using their smart phone, the technician can use the 3D CAD estimation app or direct into the printing web site any place anytime around the world. This data can be then printed on site on any standard office laser printer which saves hundred of dollars in handheld devices and cartridges. All this talk about new ways is just the same old way, our method is better and you save hundreds of dollars on every installation. Handheld printers cost hundreds of dollars and the cartridges even more, we use to use them on site and it cost us a fortune in replacing them, on one site we had to label the AP in the ceiling and when labeled I put the handheld labeling machine down on the ladder so I could screw the data jack lid on which was no more than two minutes. Yes I came down and gone was the $200 handheld labeling machine and to twist the knife more I just put a $46.00 cartridge in it. Running eight installation teams it just was too much on average one per job site went missing, so enough was enough and we moved to laser printer cable label printing along with data jack and patch panel labels and never looked back with thousands saved in the long run. We now sell labeling systems and have our label printing software FREE and no sign up at www.printmycablelabels.com now to be linked to our 3D CAD estimation software with auto labeling all web based and working on any device. So just to make sure that we all understand “Print Cable Using Data Generated as Part of the Testing” is nothing new and handheld labeling machines cost a bunch. So the next time you think about labeling a installation give our system a try we support you across three time zones and our products are tested by our own structured cabling guys. Our market-leading cable label software is now on line and FREE, you can create labels quickly, reliably. 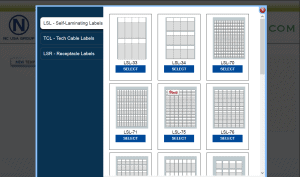 Print my cable labels web software is a powerful tool that allows you to print your own data into predefined standard cable label templates or create customized label layouts to your own design for FREE. This entry was tagged best cable labels, blog, cable labels, cable labels USA, free web based printing software, handhelp printers, LSL 75, wire marker +, wire markers. Bookmark the permalink.